Without batteries to store energy you would only have power when the sun was shining or the generator was running. This tutorial describes the 4 basic types of batteries & provides some good tips on the care & feeding of your batteries to maximize their performance and life. RV or Marine type deep cycle batteries are basically for boats & campers and are suitable for only very small systems. They can be used but do not really have the capacity for continous service with many charge/discharge cycles for many years. Regular or Car type batteries should not be used at all because they cannot be discharged very much without internal damage. A very popular battery for small systems is the Golf Cart battery. These are Lead acid batteries that have caps to add water. Many manufacturers make these types for Solar Energy use. They are reasonably priced and work well for many years. All flooded batteries release gas when charged and should not be used indoors. If installed in an enclosure, a venting system should be used to vent out the gases which can be explosive. Absorbed Glass Mat batteries are in my opinion the best available for Solar Power use. A woven glass mat is used between the plates to hold the electrolyte. They are leak/spill proof, do not out gas when charging, and have superior performance. They have all the advantages of the sealed gel types and are higher quality, maintain voltage better, self discharge slower, and last longer. They are more expensive, but you usually get what you pay for. 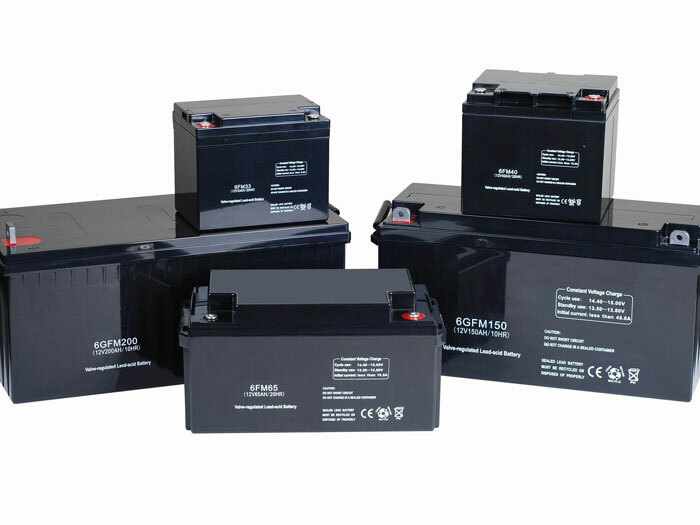 You will find this type of battery used in airplanes, hospitals, and remote telephone/cell tower installations.